A dry cow is a mature cow that has been “dried off” meaning she is no longer being milked by humans or nursed by calves and has stopped producing milk. A cow is typically dry for the last 60 days of her pregnancy. Note: EVERY cow deserves and needs a dry period! In this period of time, the udder is not being used for milk production and can rest and rejuvenate. Secondly, allows for the production of strong colostrum. Also, the calf inside the cow grows the most in the last two months, so a cow can put 100% of her energy toward raising a healthy calf. Before drying off, determine how many days you want the cow dry. Find the breeding date and use a gestation chart for dairy cattle to determine what day the cow is due to calve. 60 days is average – be sure to add on another week or so to actualy do the drying off process so that her 60 days are all days not-in-milk. Longer dry periods can be effective for thin cows. We find that now, being primarily grass fed, our cows do better with a 3-4 month dry period and they do not gain too much weight during that time. Shorter dry periods 45 days would be the minimum recommended dry period, even for an obese cow. A few days before drying off, start to feed lower quality long-stemmed roughage or put the cow in a poorly producing paddock. Stop feeding any grain. Monitor udder every 12 hours. If the cow is doing well, continue monitoring but do not milk, do not feed grain, and keep feeding only so-so quality hay. The intention here is to tell her body to stop producing milk. You may see the udder fill up and may see some leaking from the teats. This is normal. Try to keep the cow in a dry area to avoid bacteria contamination through the teat ends. Some will continue teat dipping a cow for a few days if the udder is dripping, but consider before doing that – you may stimulate the udder which is something you’re trying to avoid doing! Final milkout: We almost always find the need to milk out a cow one last time, this is usually somewhere between 2 and 3 days after stopping milking. How? After you stop milking the cow, her udder fills up with milk. As you monitor the size and shape of her udder, you will notice one day that it starts to shrink back up/deflate/lose swelling. This is the cow’s body reabsorbing the stale milk. After this has started to occur, the cow knows it’s time to dry up. One final milkout at this point relieves the udder of the excess milk. Dispose of the milk on your compost pile, please do not drink it or give it to other animals. If a dry cow treatment is needed in one or more quarters of the udder, this is the perfect time to give it. First, go to “once-a-day” (OAD) milkings for 2-3 days. Second, if OAD is going well, skip two milkings in a row. If after that she has a huge bag of milk, milk her out and skip three more milkings, then review. If she hasn’t made much milk, then skip her another day or two and milk out one last time and you are done. Sample dry off schedule: OAD for 3 days; every other day for 4 days (so, two milkings); then stop milking. Go 3 days, milk out one last time. If your cow is a high producer and doesn’t want to quit, you will have to just stop at some point and let her be uncomfortable for a few more days. When you are confident she has drastically reduced her milk production (visual sight of the bag starting to recede in size) milk her out one final time. Then administer dry treatment if needed AT the time of last milking. So, on that day, milk her out completely, then administer dry treatment, rub and smoosh the antibiotics around because you want it to get all the way up into the udder as far as you can get it. Note in your records that she was treated, in order to remember to discard the milk for the proper withdrawal time! DO NOT milk her out again until she calves. Some argue a cow should be stopped cold turkey, we have had success doing a more gradual decrease on high producers. If the cow is only giving a few gallon a day or less, cold turkey can work just fine. First, what not to feed: Grain! A dry cow does NOT need grain to grow a fetus in most situations and grain often creates problems such as preventing dry off, acidosis, fatty liver, etc. If a cow is thin, we highly recommend considering a longer dry period, which is a safer method of putting on weight vs. feeding grain. If you plan to feed grain to the cow once she is milking, you can slowly add grain back to the diet a week before calving or even right around calving time. Start very slowly, just a cup or two, and gradually work up to her full ration over a couple week period. The main diet of a dry cow can be grass hay or pasture, although limit high quality pasture around the time of drying off the cow to avoid stimulating milk production. Maintain adequate nutrition throughout dry period. 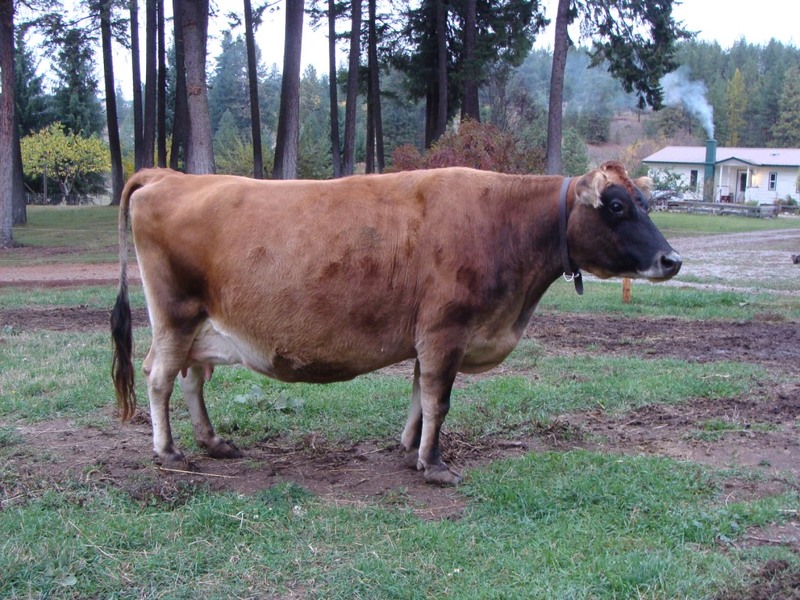 (See body condition charts and ask knowledgeable people to determine your cow’s condition. She should be between 3 and 4 on body score.) A cow too thin or too heavy is at increased risk in the weeks before and after calving. Continue feeding loose minerals and loose salt – Did you know that a dry cow will often consume more minerals than a lactating cow? Note: removing salt from a dry cow’s ration is more likely to be harmful than helpful and is not the best way to control edema. If available, feed a dry cow mineral rather than a lactating cow mineral – Limits phosphorus. In Selenium deficient areas, consider using high-selenium loose salt – especially important for the dry cow period as selenium has a direct link to parturition (calving) needs. Ability to exercise daily is important to maintain muscle tone and is just as important as what you feed a cow. Clean water and 24/7 accessibility to clean water is always important, too. FAQ: Why do I need to dry off my cow? Drying off is NOT just about colostrum! Cows require 60 days to relax, take a break. They need time to build back up their strength, body fat, minerals, etc. Plus, the last month or two are when the calf inside her is growing the most. She needs all her strength to calve and have a healthy lactation. If you never dry her off, it will affect greatly her next lactation and can lead to reproductive problems and all sorts of other issues. Powdered colostrum is for the rare chance that a calf cannot get colostrum for the mother. Powdered colostrum/milk should be a worst case scenario last resort.Can you milk through? Yeah. Should you? No!In all the cows I’ve worked with, we’ve never had a cow refuse to dry off. Operator (people) error is more the issue.